Looking back at my first Moontime, I still remember my panic stricken Mum pulling out one of her big overnight pads and cutting it in half with the kitchen shears before my horrified eyes. She was so unprepared. I'm not sure who was more startled, her that I got my period, or me having to use half a pad with the stuffing spilling out onto the floor. So here we have something to solve that problem, and to gift to our beautiful and brave daughters, to ensure they get the very best start from the beginning. I now offer 2 new designs with young girls in mind. Teen Regular is an inch smaller than my standard medium flow, and a little narrower, so much more suited to teenage bodies. 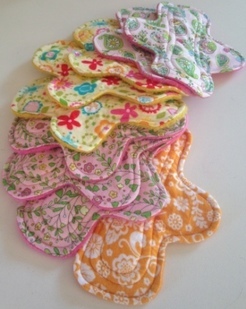 Its a little less overwhelming to the young lass who really doesn't want to wear a 'mum pad'. And for overnights, I offer Teen Night, which is a smaller version of my standard overnight. Offers the same absorbency as a Medium Flow but with less bulk. Better suited to teenage, or petite bodies.